I thought I’ve always been one who loves instant gratification because I really prefer to buy my stuff and get them on the spot. However, it seems I’ve had a change of heart over the past year or so. I still prefer to buy from the stores but with more online stores that offer lower prices, it would seem that shopping for my beauty products online make better sense. So do I now prefer to buy my beauty products online? Well, yes and no. Shopping in stores for beauty products still appeals to me because I get to see, touch and smell the product. I also get to test the products. Most important perhaps is that I still love the thrill of having instant gratification. However, I realized that variety is not always as great for some of the imported brands and prices are not always as appealing. The worst pet peeve I have of late is that some of the sales assistants do irritate the heck out of me by pushing me products I don’t want or not being able to answer questions I asked. I even consider some of them a harassment that spoils my shopping experience! Now shopping online means I avoid any unpleasant personalities altogether but it doesn’t erase unpleasant encounters. I’ve had my fair share of woes especially when products are not sent or if they were sent, they were the wrong items. Going through the whole process of lodging a complaint is really time consuming and it’s something that irks the heck out of everyone. However, shopping online for beauty supplies gives me more options and choices, and I get to enjoy lower prices for some products too. But of course there is the time factor and shipping cost to consider, on top of the fear of lost shipments. But I think if you ask me, I’ll say I prefer to shop online these days for my beauty products because some of the stuff I want and need aren’t available in the stores anyway. I’m also quite used to purchasing brand new skin care products online, just based on studying the ingredient list. Except for some exceptions, most of the products I’ve ordered online have worked well for me. And having said that, I want to take the opportunity to urge all online stores to please list their full ingredients online. I will not purchase products without first knowing what goes in there and I believe many readers of Viva Woman are like me! So how about you ladies? 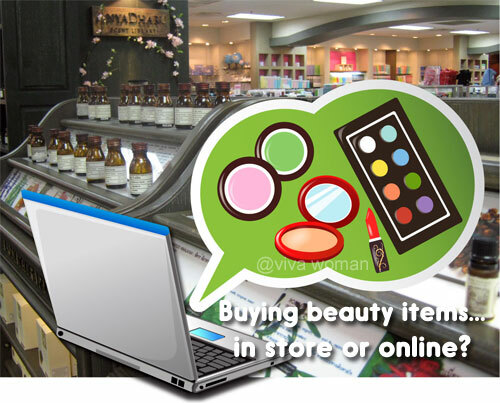 Do you prefer to buy your beauty products in the stores or online? 5 online stores for natural and organic beauty products Would you buy a new skin care item online? 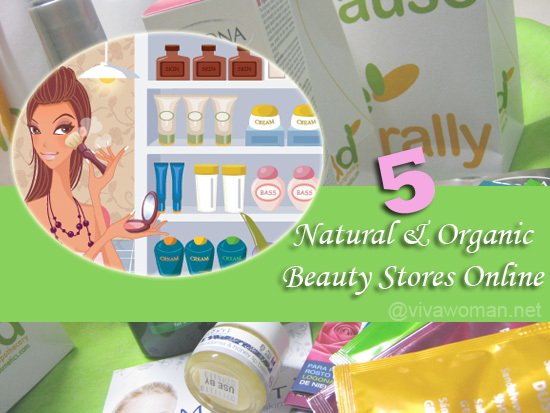 5 reasons why I’ll only buy green beauty cosmetics from specialty stores Share: do you buy beauty stuff cos they are NEW? I still prefer buying from a store.. preferably one that offers a how to do it class.. for example I purchased my basic make-up kit from Jill Lowe as it allows the consultant to see my skin tone and advice the best combination of colors and texture… however for things that does not require a lot of personalisation (like shampoo) I would be ok to purchase online. I see…buying in stores does offer more personalized service as long as they’re not pushy. I don’t like buying shampoos online though (from overseas stores) cos the shipping is high due to the weight. Previously, I enjoyed shopping on th spot but when my job started to be more time-demanding, I had no choice but to switch to online shopping. Then I also began to realize the “pros” of doing it online — no pushy salespeople, no time pressure, can be done even after mall hours and can do research and reviews about the products while browsing through them. Downside is having to wait for the item/s or sometimes getting the wrong item. Yeah, no pushy sales staff! It’s great to shop online if we know what we want but otherwise, I also find it slightly time consuming. My online shopping has exceeded more than shopping in the stores these 2 years. The main reason I tend to like online shopping is the vast variety they offer and the price is indeed much more reasonable and cheaper than those in the stores! Agree about wider variety…and for DIY items, we have no choices in the stores! Definitely In Stores! As I am very “oc” in terms of checking out expiration dates. I’ve once ordered online then the product came out not expired but to be expired within the year ! Ah…expiry date is important; it’s unacceptable that they ship you something which is going to expire soon! as for beauty products, i may buy color makeup at the stores coz i need to see the shade on my skin; sometimes i’ll swatch and then buy online or at Changi’s DFS for much lower prices. as for skin and body care, unless it’s going at 30% off in the stores and staples, i’ll just buy them at the DFS or online…there are so many reliable options now with free international delivery, why should i bother with less than satisfactory offline experiences? that said, the internet came about just as i was in university and i’m totally comfortable using it. some friends i know aren’t and still buy everything in the stores. i expect younger people to do much more shopping online if they’re comfortable using it. Agree about “less than satisfactory offline experience”, some of the sales staff totally put me off shopping altogether. I think I’m still buying more beauty products in the stores but when it comes to fashion items especially accessories, I prefer to shop online now cos I get more unique stuff. I am getting to like buying clothes online although I still don’t get misses on and off. I need to improve my judgement in that area. Wow, you’ve been shopping online for a decade already? You’re adventurous! I used to just buy skincare products from stores, but ever since I started purchasing them online, I got hooked! Haha..I usually buy them online nowadays and to be frank, I like it cos I get to research and read reviews about the products I intend to buy. In fact, I will no longer buy a product that I either have not seen/heard before or that I haven’t read about the reviews online. Yeah, good thing online allows for research and reading reviews. I do quite a bit of that if it’s a new product I want to try. I think I practise a good mixture of both. I only buy reliable items online, meaning those that I have researched well, have great reviews, or are repurchases. Other than that I feel the need to test. Clothes and shoes are extremely hard to buy online since I do not have a standard figure (wear S but have M shoulders, waist S but can be L at the hips). I am also very picky about texture of skincare and smell. And for cosmetics, my skin colour happen to be hard to match, so I need to test products on skin. Even for bags, I am picky about quality in terms of material, sewing, and cut. So it is kind of no way I will buy online. jyoan last post is: Empro Brow Pencil in Singapore!!! I don’t know why but I’m pretty adventurous about skin care products and more so with sunscreens. I would buy new products online just to test. As for clothes, I am getting the hang of it but still not so good. I’ve never bought shoes online as far as I can remember. For my first experience buying makeup online, I was disappointed with the size of the item as like you say, some things are not based on your expectations. I do like buying in the stores but wish some items are not so expensive. Leaves me no choice but to purchase online. i prefer online shopping nowadays only because my favorite online store delivers the day after order date (Luxola) and if i pretty much have the idea of the product i’m ordering (like i’ve used it before or i trust online swatches, for makeup). but when it comes to foundation, i would still buy in store unless an online store has a sampling kit, like with Sleek and most mineral makeup companies. same with skincare, i also prefer in store shopping, mostly drugstores. I agree that foundations can be tricky to buy online cos the colors are not always correctly reflected. And oh, like you, I like buying from drugstores too. I’m an “ingredients junkie”, meaning I need to research the labels line by line, which means I do a lot of research on the online shops before purchasing products…from bricks & mortar stores. To me, the actual process of buying in person and asking questions from the staff about the product often adds value. Offtopic, I made an amazing discovery yesterday, mixing charcoal powder to rice flour and water, for a face mask. Had the facemask on for 10 minutes…and miracles happened: all the pores on my face had disappeared! I did some research afterwards, and the pore minimizing effect seems to be the main way charcoal works on a facemask, but I had no idea it would be that effective. I don’t know about asking the staff…most of them don’t give me satisfactory answers! Wow, your charcoal mix sounds interesting and amazing. Must try to get hold of some soon. I had done a post n the same lines long back…even I like instant gratification and physical presence but sometimes online sites are too convenient too pass up!! There are so many online stores these days and it’s hard to pass them up like what you’ve said! And yes, lots more choice for natural, organic products. True about more choices for natural/organic products. Definitely online! I’m an introvert and hate begin approached randomly for “help”. I never need it – I know exactly what I want and I read ingredient lists thoroughly so I end up spending a long time in the store (hence raising their suspicion). I like the freedom of just getting what I want online with zero hassle, and I make sure the store has tracking and a good refund policy. So far, none of my orders have gotten lost of damaged – whew! Also, I tend to buy more natural beauty products, which are a pain to find in stores. Online it is! It’s true…shopping onlines gives us more freedom to “roam” without being scrutinized. Like you, I also dislike being approached randomly by the sales staff. I think both ways are great it all comes down to what. I wont ever buy cloyhes online because I need to see how it fits. But skin care I prefer to buy online because there are more options. Never going to buy certain color items such as lipstick and foundation that although I can search for swatches it is still hard to know how it will fit me and the texture and stuff. My problem with online shopping is the risks , the shipping etc But usually the items I want is limited around me so I go to online stores. And sometimes is just too troublesome to go to the store if its faraway. Yeah…same reason…limited choices drove me to go online. I see a lot more brands available online that I can get here too. As for clothes, I’ve become more adventurous but I guess the item I buy the most online is accessory. True. I buy a loot of accessories online too. Ah well~ I do both depending on which offers a better price ^^ But what I also do is that I would sample the products in stores (mostly), and if I could find cheaper alternatives online then online it is!! So far my online shopping experiences are good, they also send me free stuff when I offered some (and a lot) useful feedbacks or when the service was a few days late haha!! Though recently I tend to shop in stores coz they now offer a “buy 2 get 1 free” VIP special at the shop I go to so it’s definitely a great bargain 😀 Another bonus is that normally there won’t be store assistants around to bug you what to buy or try, so that’s even better!! I’ve had two to three unpleasant online shopping incidents though…both overseas and local. I also don’t always shop with renowned stores and so there is a risk to take there. It’s 50-50 for me. I think when buying new products, I prefer to buy in stores, coz then I can ask more about it (provided they know their products), and I can try it… but after I know what I want/need, I’d buy online. Mainly it’s because of cost. Most of the times, online prices are much better than in store prices (unless the stores are running specials), and sometimes I can find more variety too. A second reason why I buy online is because I can do it whenever I feel like it, I don’t have to go to the stores when I don’t have time to go there. That’s wise…cos it’s better to get a feel of the product before buying online. Sometimes I buy stuff online without trying first and end up being disappointed much. I use both technique, If I used a brand which I had bought from store and later I found it online then I don’t hesitate to order from online. Also, most of the time, online stores offer discount on many products. So, Why not try online If I get a product with cheap price :). Yeah, that’s definitely a wise thing to do. I definitely buy a lot more things online now than in the past. For one thing, as I got older I started to detest crowds and shopping in town became more of a chore than the retail therapy it once was. I’ve also walked out of a shop more than once before when plagued by salespeople that hover behind me and dog my every step. With online shopping I can take my sweet time to select my items & read reviews to my hearts’ content..any time I like. With the bonus that so many things are so much cheaper online. Things that I buy often like essential oils & health supplements can be 1/4 the price online and just as good quality as those in shops. Oh iHerb!!! I love that the most! Is that where you buy too? Haha! Yes, I buy most of my stuff from iHerb! That site has made buying natural products so much more within my financial reach. Their shipping is soooo reasonable too! Besides there I just buy random items here and there from small vendors on Ebay, Amazon, etc. I’m intrigued by Mountain Rose Herbs but haven’t done my math yet on whether the shipping is too ex..
Online stores provide a better variety of products as compared to offline stores. Also the prices are lesser. Hence it makes sense to buy online – my own personal opinion. Yes true! Just checking out a particular tweezer and already noticed the huge price difference. 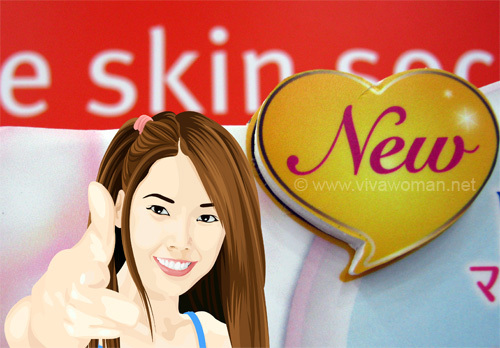 I have been buying online beauty products , household items , laundry products etc. for the past 3 yrs! Yes, definetly value for moni, more interesting stuff which we can get at local store. Am just amazed by the choices..